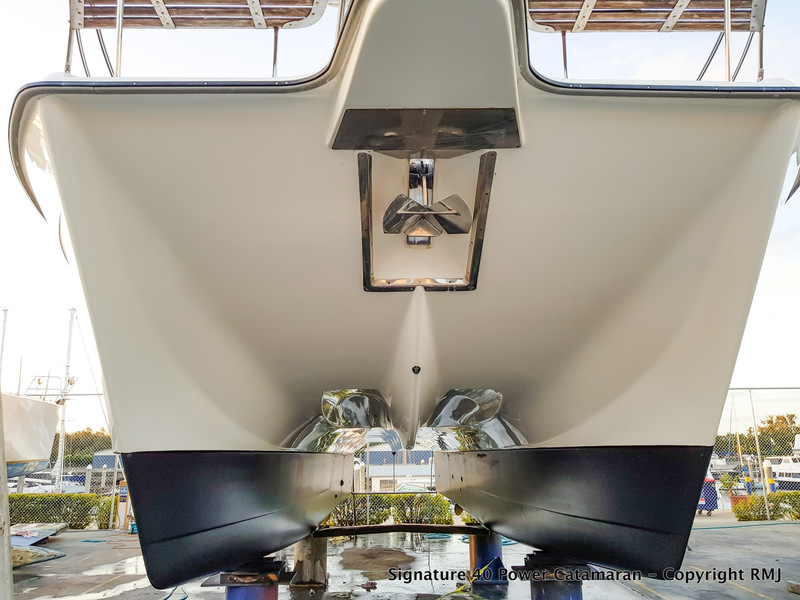 The Signature series has stemmed from the legend himself, John Haines (Haines Hunter) & his two sons. 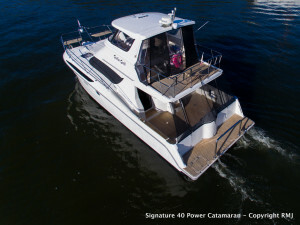 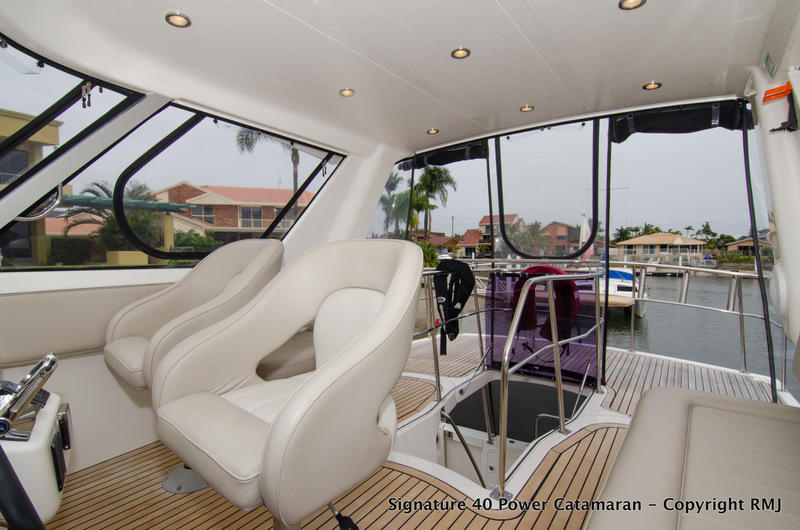 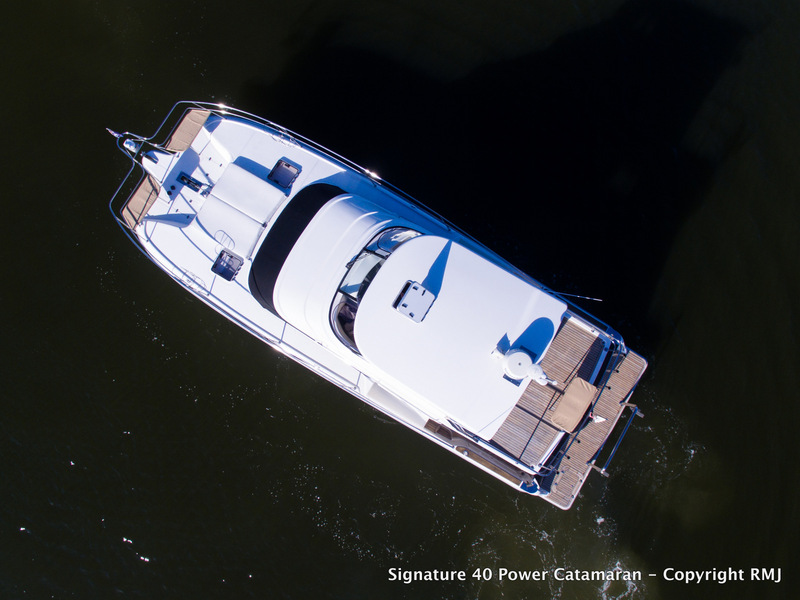 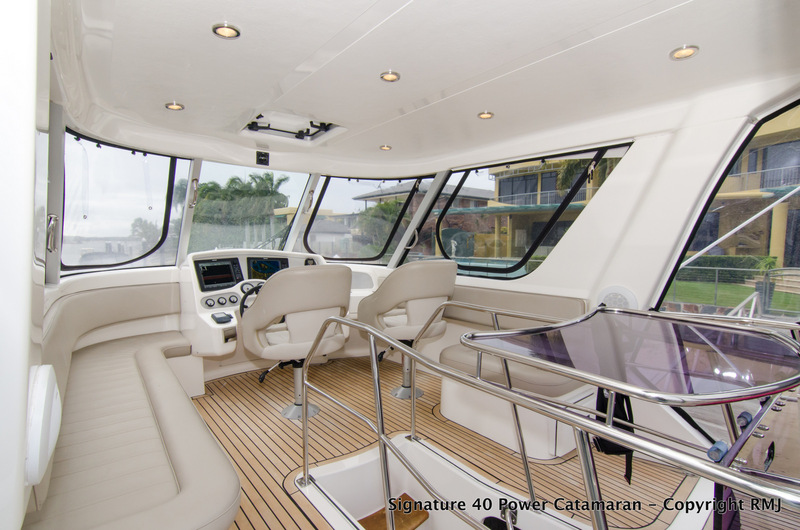 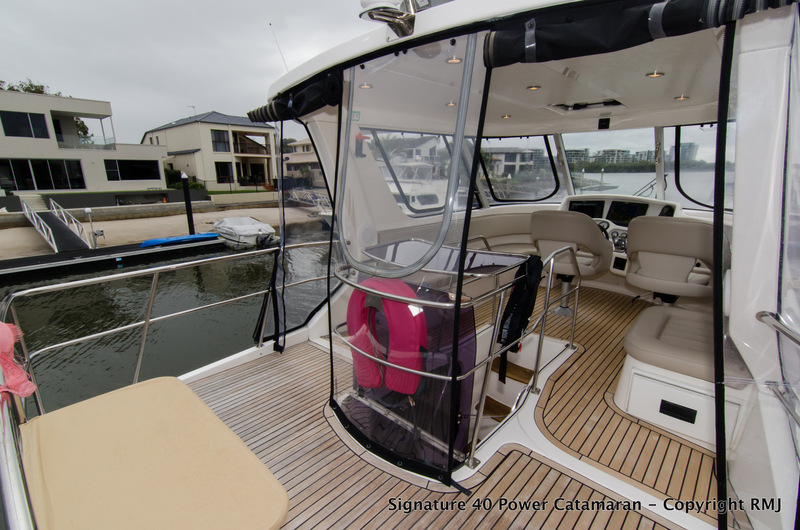 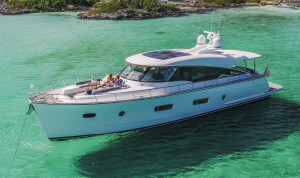 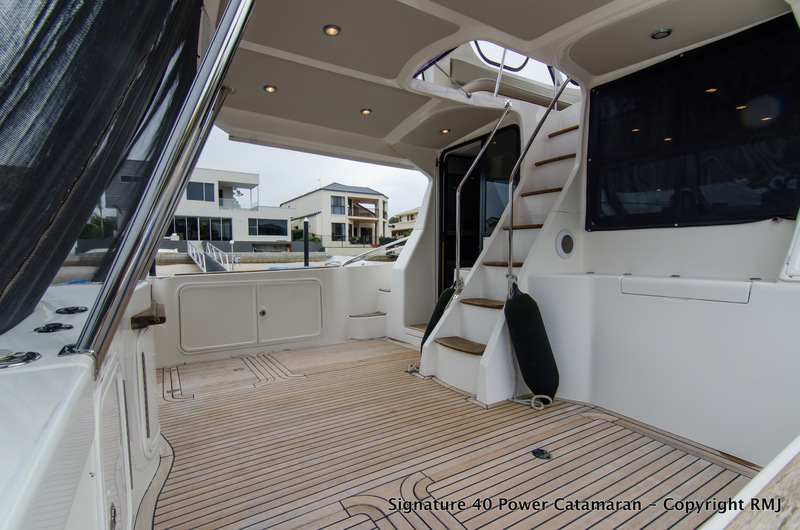 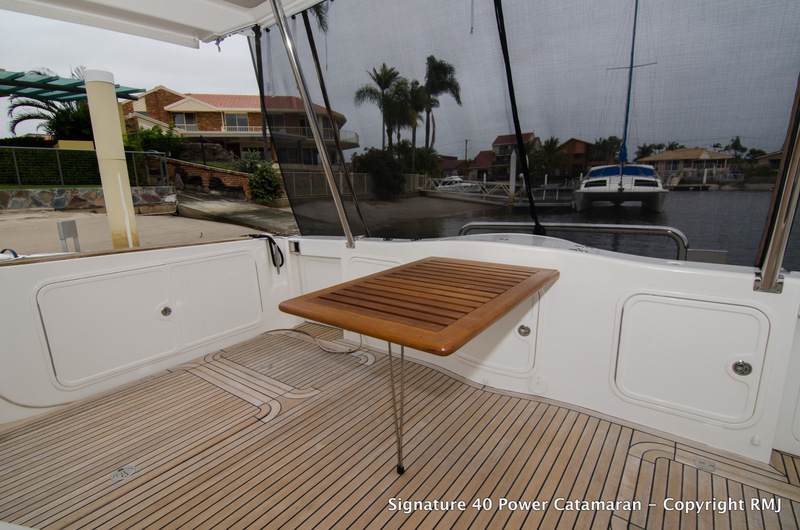 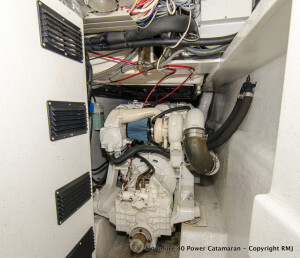 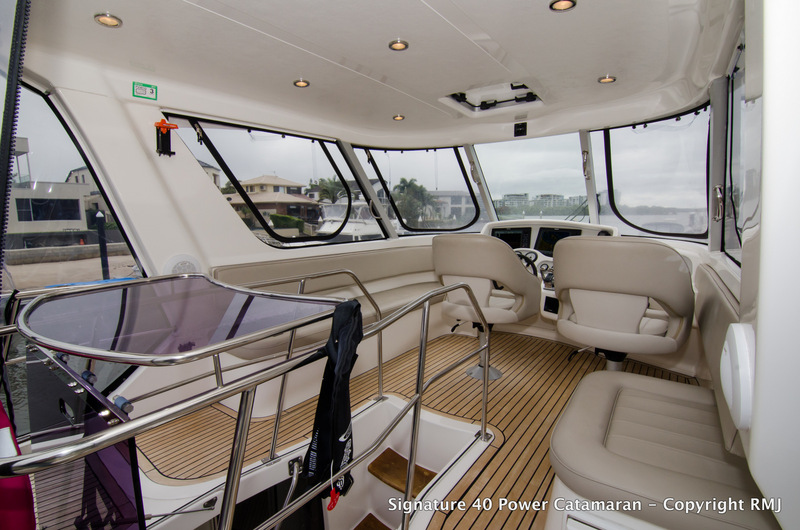 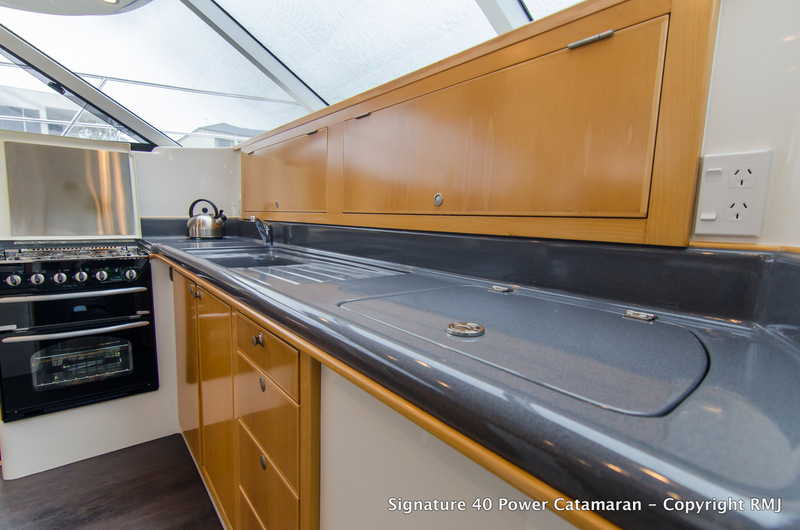 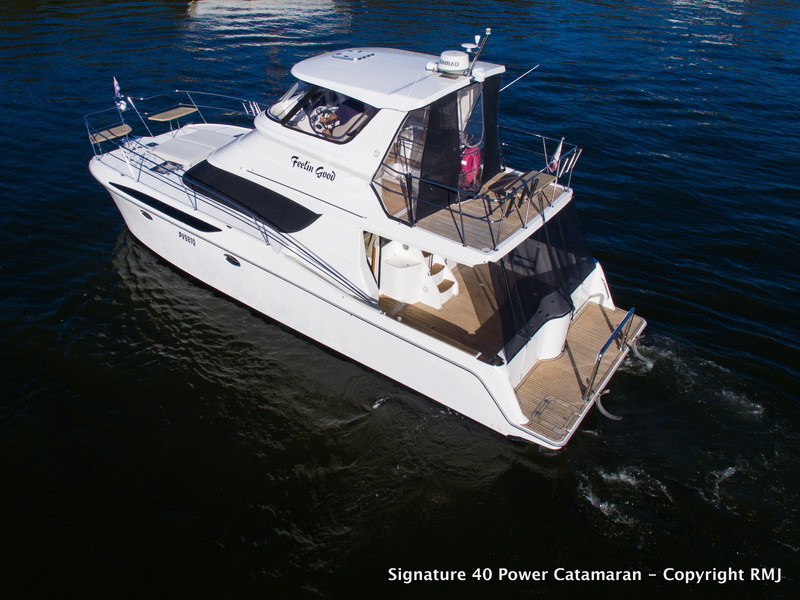 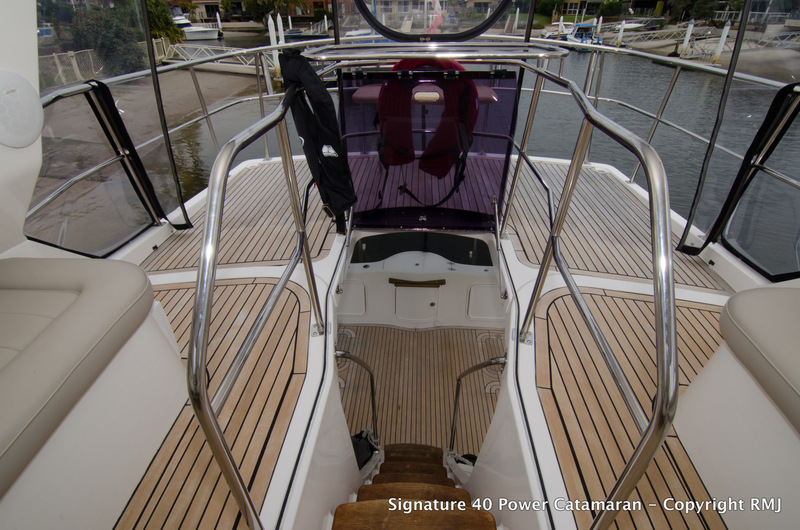 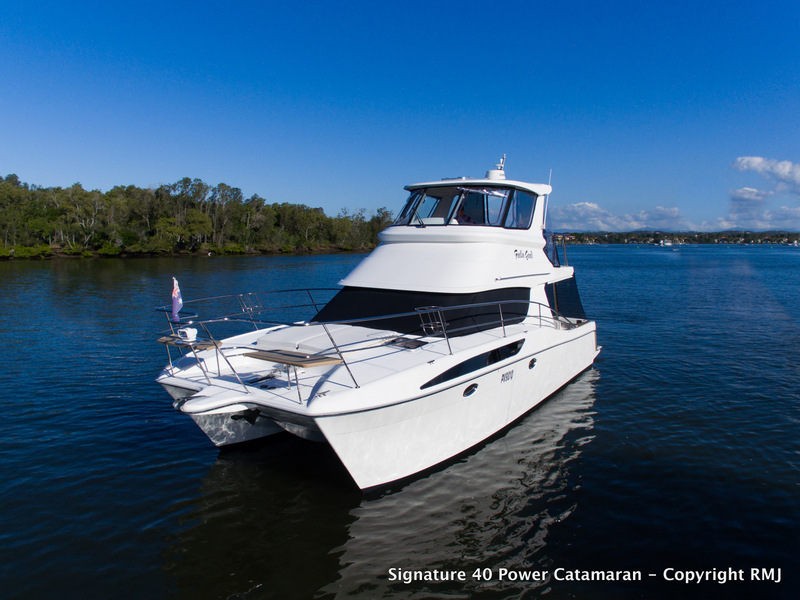 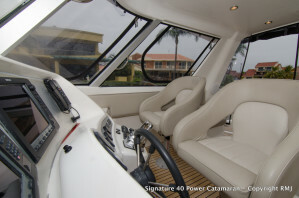 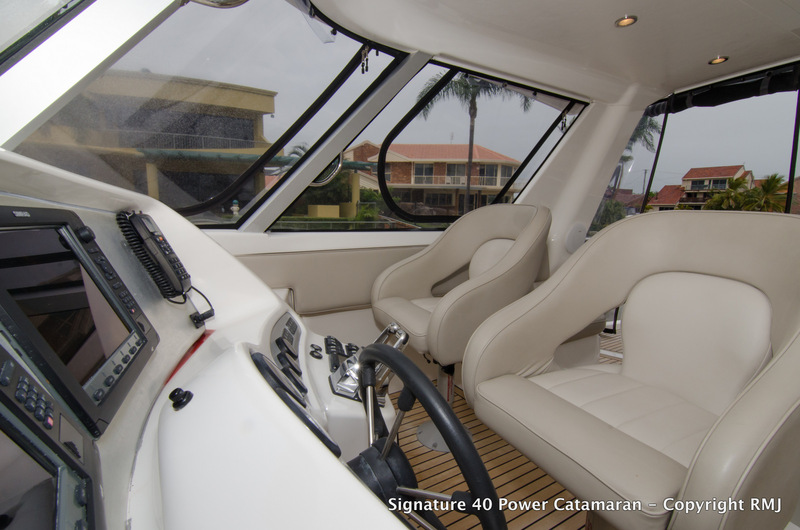 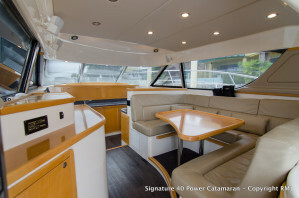 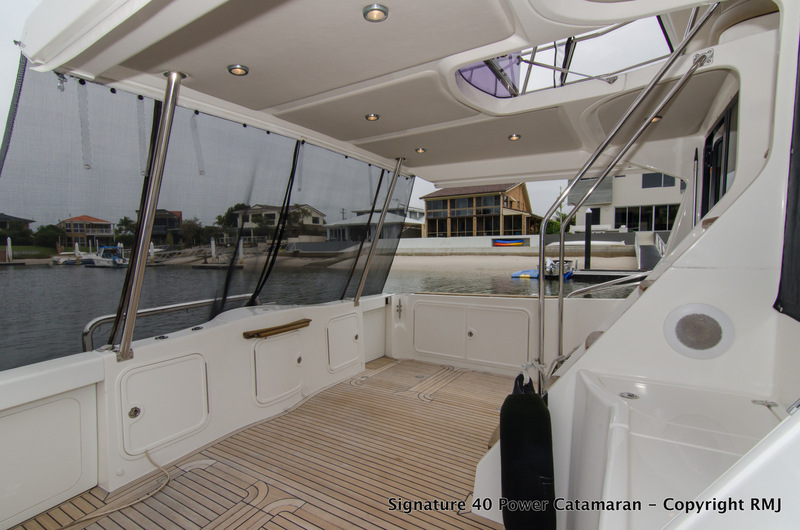 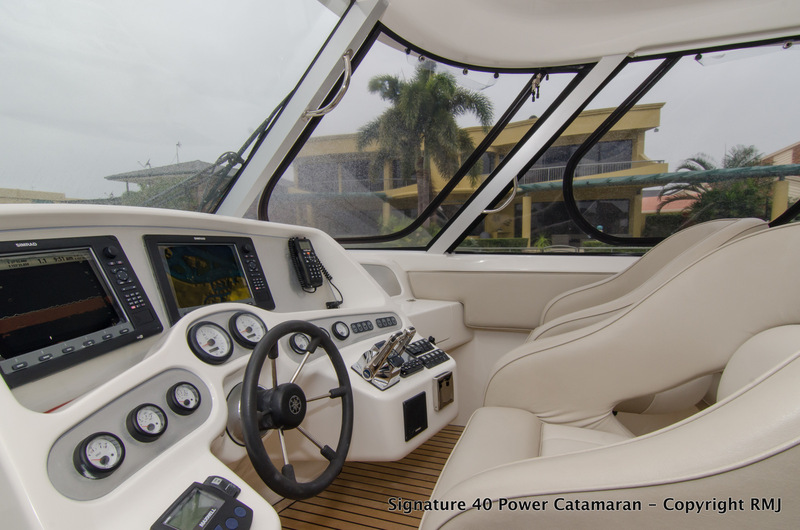 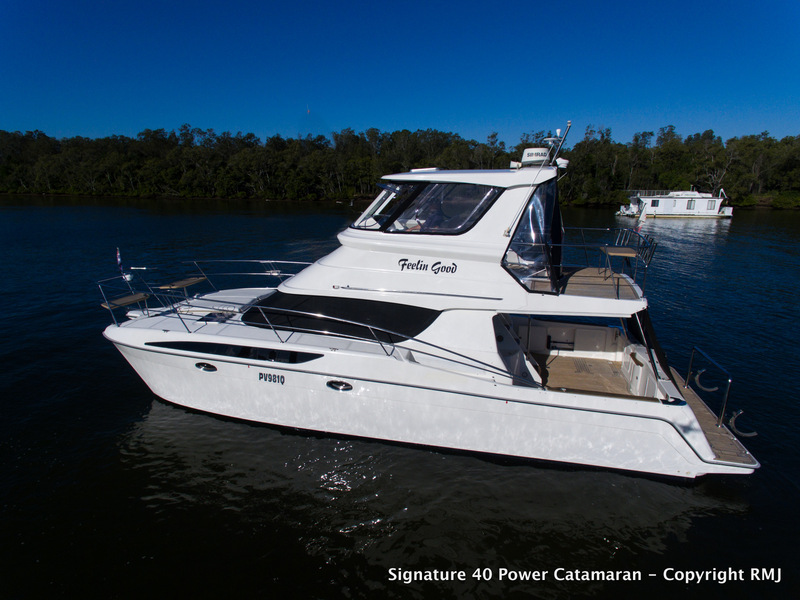 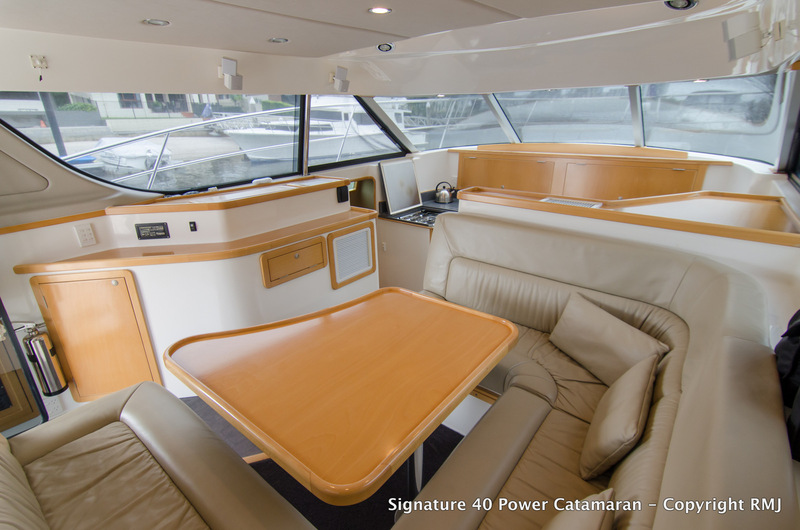 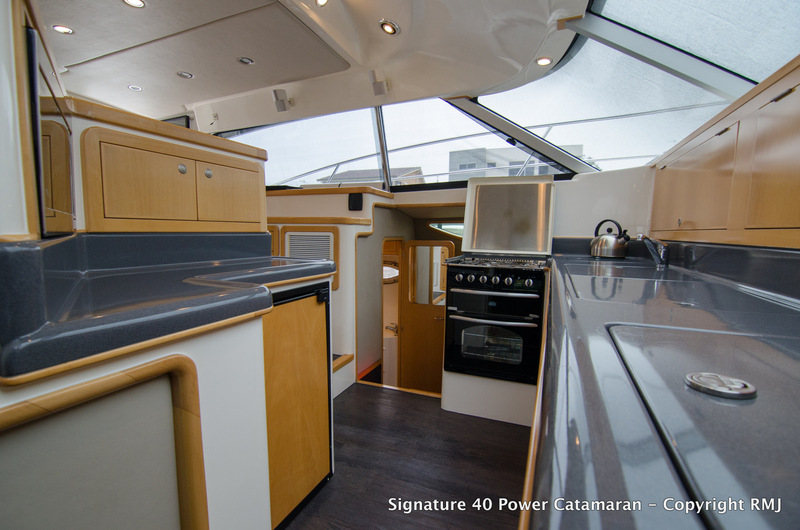 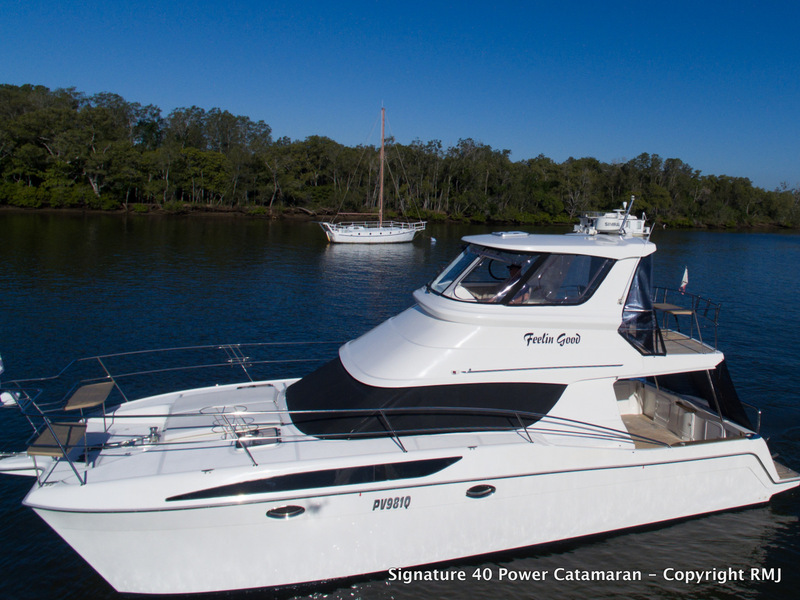 The design and practicality throughout the Signature 4000 Power Cat Flybridge is outstanding. 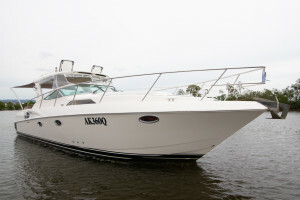 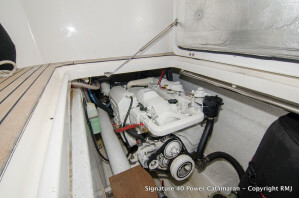 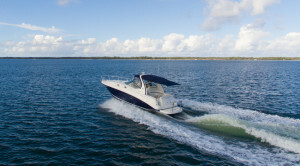 Powered by a pair of Nanni Diesel 320hp V-Drive, with great access from the cockpit, and forward engine room access through the port bathroom and starboard guest cabin. 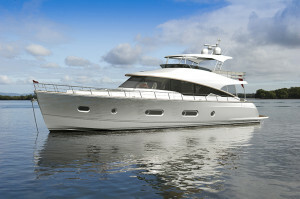 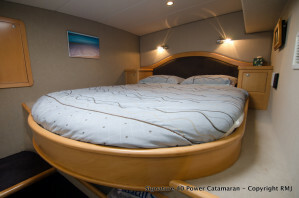 The accomodation layout of this boat consists of 3 Cabins, and a convertible saloon lounge. 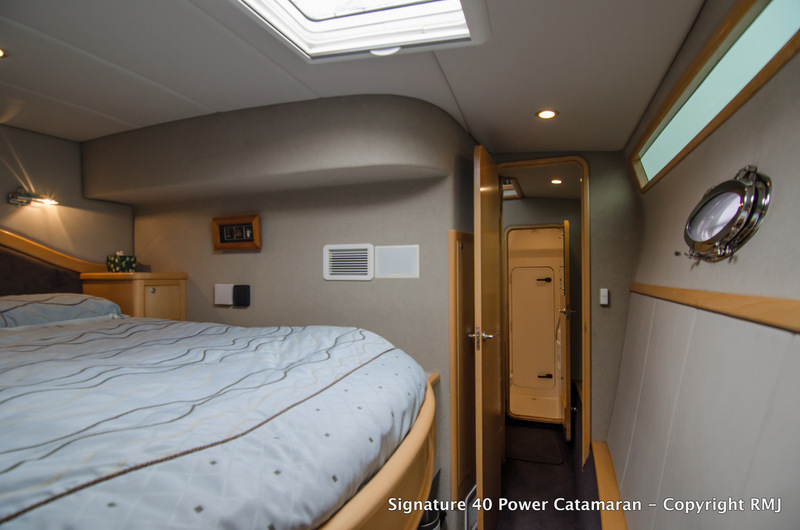 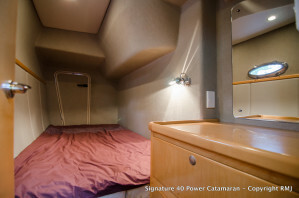 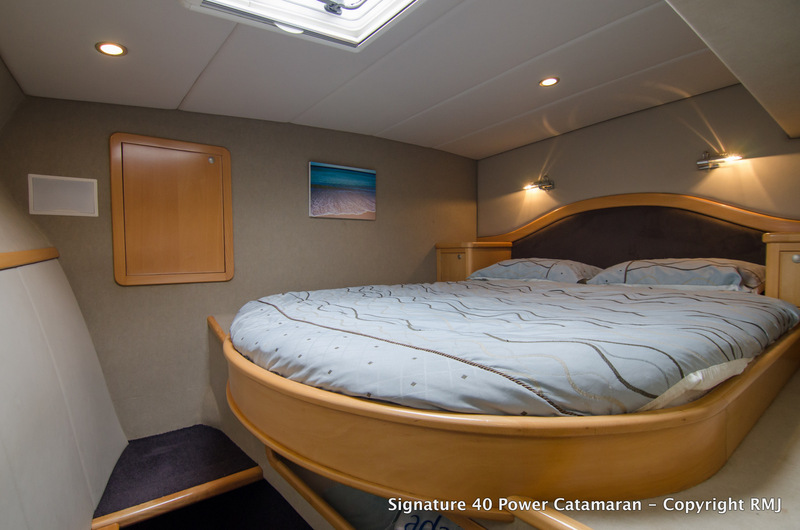 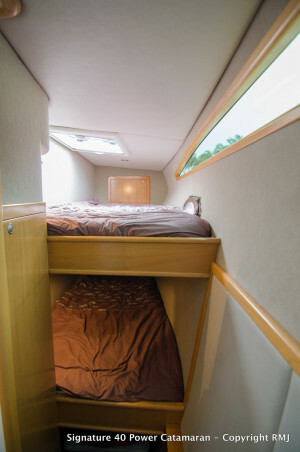 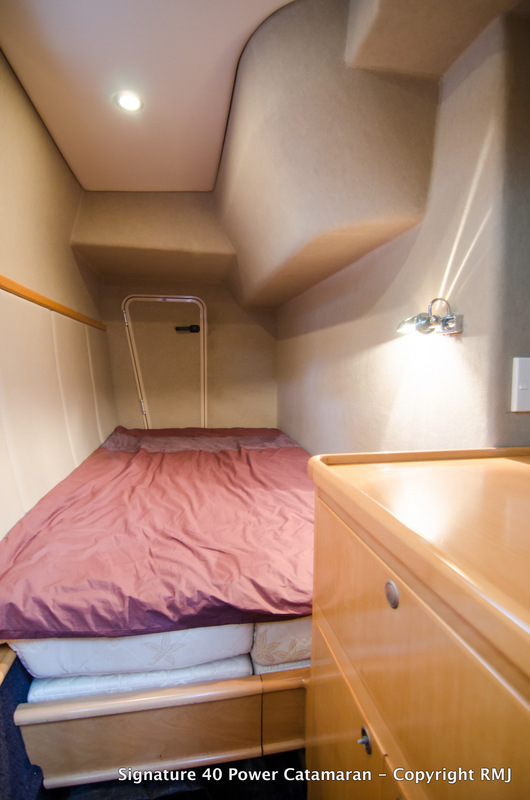 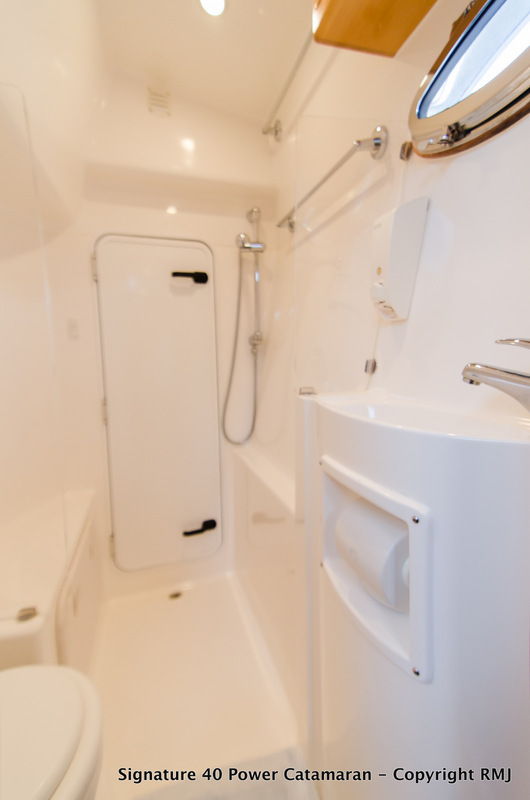 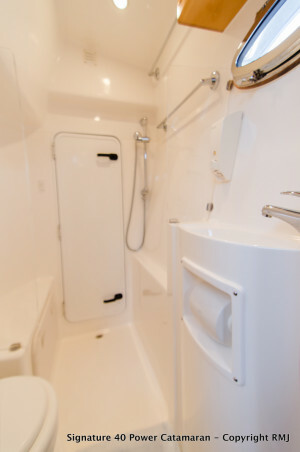 The master cabin is on the port side, with a walkaround double bed and ensuite, across the starboard side is a double bed to aft, and a bunk bed configuration layout forward. 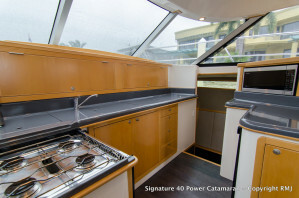 The galley is situated forward, and nearly covering the beam of the vessel. 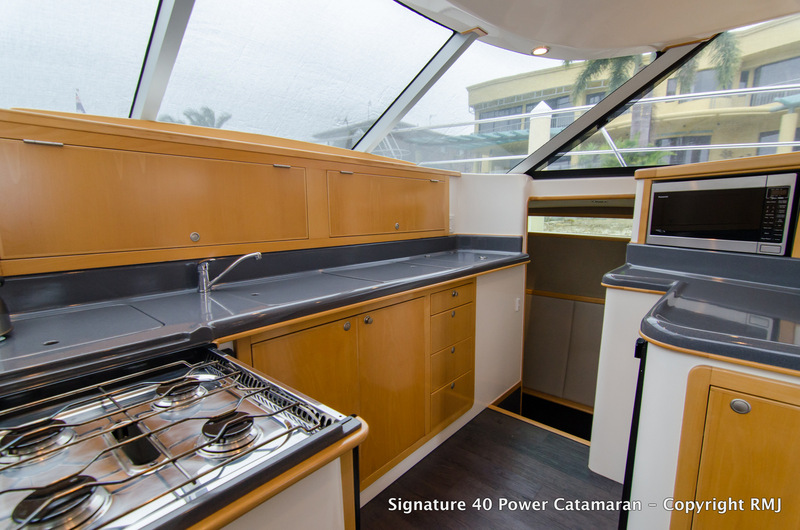 She is well equipped with a 4 burner gas stove, oven, microwave, large serving bench and sink, door fridge, and chest fridge in galley bench. 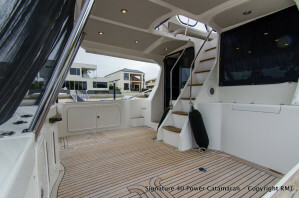 There is a moulded center stairway leading up to the well laid out flybridge. Two helm chairs are situated in the center of the bridge, and two lounges on either side. 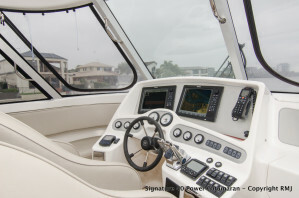 A set of Simrad GPS Chart Plotters on the dash, with Simrad Autopilot, and Muir Chain Counter. 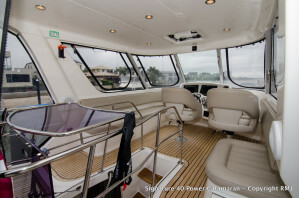 To the aft of the bridge, there is a drop down breezeway seperating the aft deck, and forward control station. 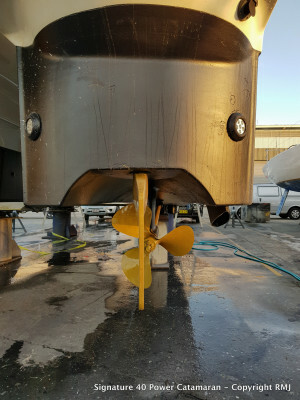 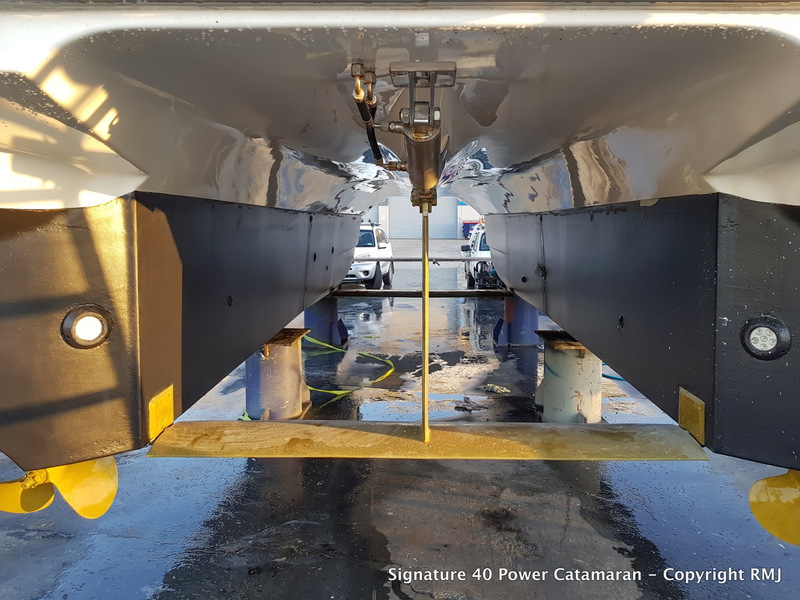 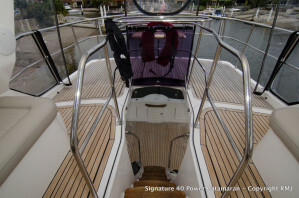 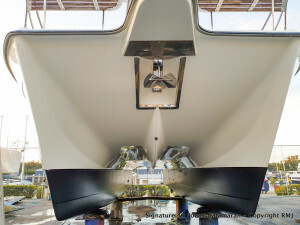 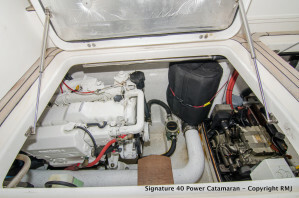 Underneath the water line, this boat has been fitted with two hydraulic foil systems, forward and aft, to make the ride smoother and effortless. 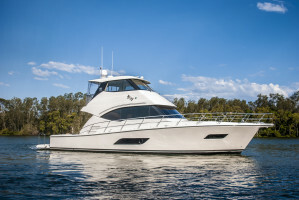 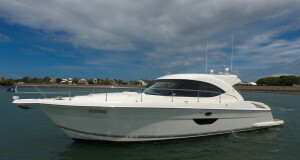 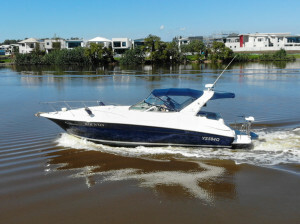 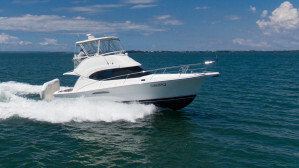 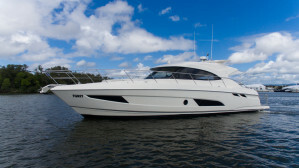 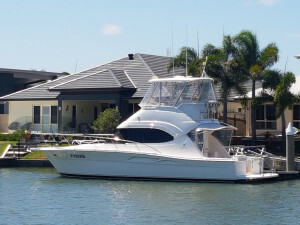 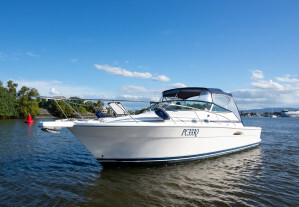 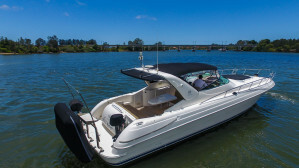 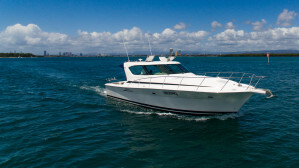 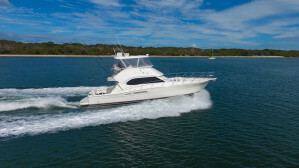 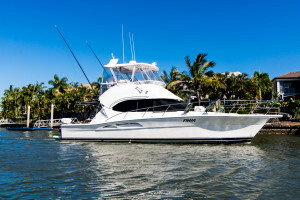 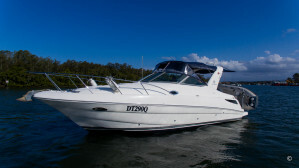 Listed with the sales office based at the Riviera facility, this boat is moored in Mooloolaba. 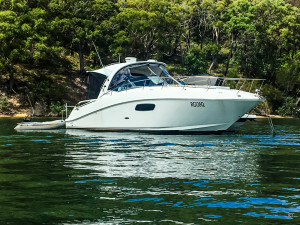 Please contact Sam Phillips on 0403 515 778 from RMJ to arrange your inspection. 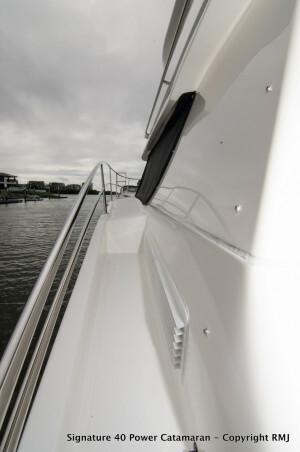 Engine Notes : Great accessibility to top sides and front of both engines. Number of TVs : 1 x 'pop up' TV to Saloon. 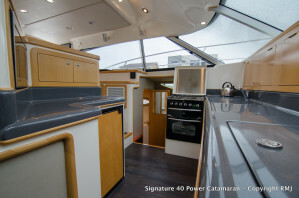 Galley Notes : Large forward galley, nearly a full beam galley. Stove : 4 burner gas stove, with oven. 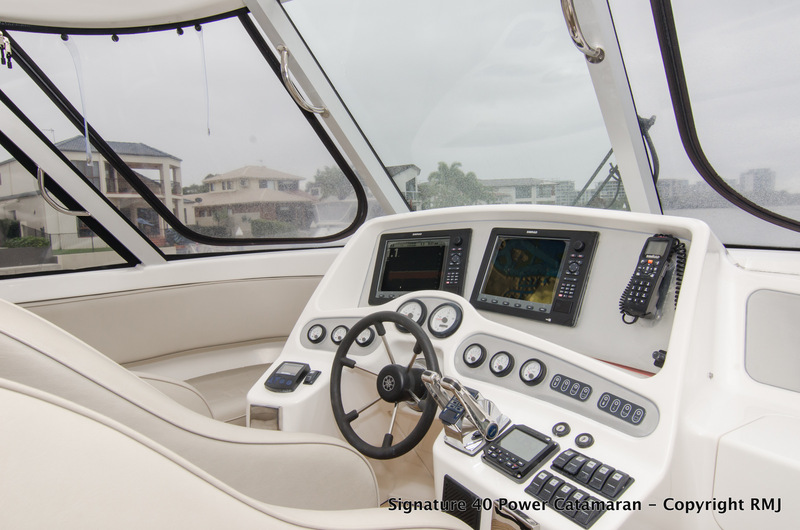 Electronics Navigation : 2 x Simrad GPS/Nav Screens, 1 x Simrad Autopilot. 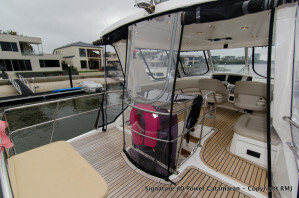 Covers : Full windscreen breezeway, cockpit centre and side breezeways, saloon heat reflecting blockouts, aft flybridge breezeway to floor, brand new teak canvas cover to flybridge back deck & swim platform. 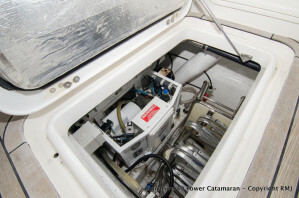 Watermaker / De-Sal : Yes, Sea Recovery Water Maker. 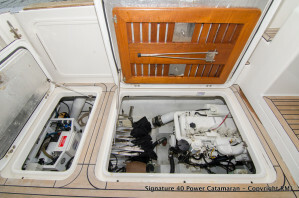 Remarks : Removable cockpit table - stowed under engine room hatch. 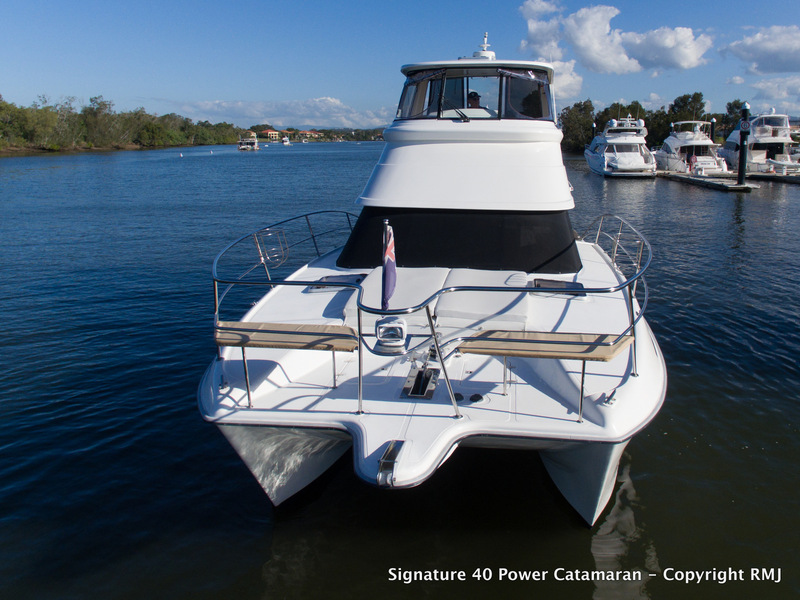 Custom Hydro-foil design to help boat lift & economy.